Movie executive: OK, here’s an idea. You know those geniuses who Jay Leno used to interview on the street who couldn’t answer basic questions like who the vice president is, or what Columbus Day celebrates? Well, what if someone like that ran for Congress and actually won? How funny would that be! Producer: Great! We’ll get Amy Schumer or Lena Dunham to play the lead! Executive: No, I said it’s supposed to be funny. But this version is less funny than the originals (which says a lot) because it’s actually happening. 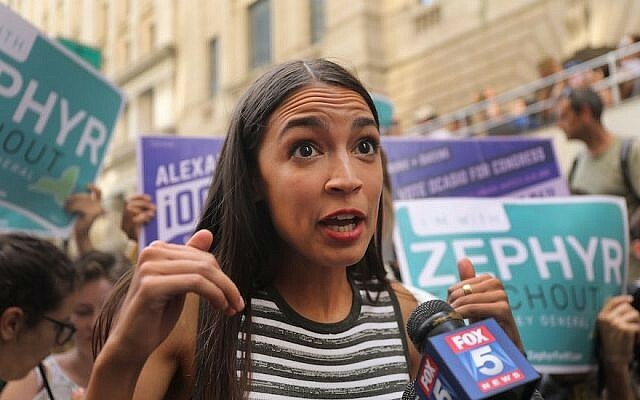 Alexandria Ocasio-Cortez is a twenty-eight-year old community organizer… or something (actually, it’s unclear even from her own website what exactly she does for a living, though she was a bartender less than a year ago)… and of the almost 700,000 people in New York’s 14th congressional district, about 15,000 of them decided for everyone else that she is the most qualified person to represent them in Congress. And though that was just a primary election, there is no doubt she will win November’s general election, because she’s a Democrat and 110% of the voters in her district are also Democrats. (I added the extra 10% to account for fraudulent voters and dead people, though that’s probably a conservative estimate). All that remains is her coronation. That has already begun, as she tours the country with her mentor, money maven Bernie Sanders, much to the delight of Republicans, who could not be happier with her sudden ascendancy to the apex of the Democratic Party. It is not hard to see why. Forget for a moment that she is lamenting that unemployment is low, and forget also that she is just wrong on the facts: many have already pointed out that Americans working multiple jobs are outnumbered by Americans working one job by about 148 million to 7 million, and, no, Americans are not working more than they have in the past. Fine. What is more worrisome is her inability to draw a logical connection between the question and her answer. Even if all workers did have two jobs, that could never explain low unemployment, because if anything, that would decrease the amount of jobs available to everyone else, and thereby raise, not lower, unemployment. It’s one thing to be wrong on the facts, but it’s quite something else to still be wrong even if your facts are assumed right. This just demonstrates defective thinking. The liberals over at Slate.com referred to her statement as a “gaffe,” but no, a “gaffe” is when you misspeak — like when she said Democrats are going to “flip a Republican seat red” — not when you are totally uninformed and can’t logically process a thought. Her economic illiteracy does not stop there. She demands that all student loans be forgiven, saying that “[f]or the cost of the GOP’s tax bill, we could forgive ALL the student loan debt in the United States,” But pointing to the “cost” of a tax cut, as though it is a government appropriation, demonstrates her incognizance of the economic benefits — such as job creation – that come with people keeping more money of their own to invest. She also claims “capitalism has not always existed in the world, and it will not always exist in the world.” Actually, it pretty much has always existed as long as people have exchanged things: goods for goods, services for services, services for goods. Any sort of productive economic activity is necessarily capitalist. And what do you mean it won’t always exist? Well, let us not jump to ridiculous conclusions. She is obviously not proposing a post-economic world where we return to subsistence farming, hunting and gathering, and forced labor (though socialism has a strong track record of producing exactly that). She just does not know what capitalism is or what she’s talking about. Okay, so economics is not her strength. One of her two majors at Boston University was economics, and she allegedly graduated fourth in her class. But she’s a millennial, so it’s not surprising that she received good grades and a diploma for apparently learning nothing, other than that life is unfair. And here’s the problem: Sure, lots of people don’t know what they’re talking about when it comes to economics, even (especially) congressmen. But like so many other millennials, Ocasio-Cortez does not let ignorance of a subject get in the way of her certainty. Worse, she’s happy not to understand, because understanding would challenge her assumptions. She doesn’t want to understand costs, because then she can’t campaign by promising everything that enters her stream of consciousness: Medicare for all, free college tuition for everyone, forgiveness of all outstanding student loans, a federal jobs guarantee that includes full healthcare (why is that needed, if everyone gets Medicare? ), cancellation of Puerto Rico’s Wall Street debt owed to “vulture funds” (otherwise known as “investors” who were stupid enough to loan money to Puerto Rico so that it actually had some), and an energy policy that will “eliminate all fossil fuels by 2035” by handing out free solar panels, eliminating all gasoline cars, and converting all power plants to… I don’t know. Nuclear power? All of them? Who cares? The “how” does not matter. And it’s not just economic costs to which she is blithely ignorant. She seems not to care about social costs, either. Of course she demands that ICE be abolished for doing its job, because that’s this month’s new thing, and we must end mass incarceration which, in her precious mind, is the cause of, rather than the result of, our urban criminal subculture that terrorizes city streets, parks, and schools. So let everyone into the country, and keep criminals mixed in with the public. What could go wrong? In sum, New York is about to send to Congress a totally unqualified dilettante who has no notable work experience, much less experience as an elected official. Who graduated at the top of her class with a degree in economics, despite not understanding the first thing about economics. Who proposes costly things despite not having any idea how they will be paid for, or even acknowledging that they must be paid for. Who demands that law enforcement not enforce laws, and cannot fathom how this could cause any problems. And, who has no compunction about opining, with moral certainty, on complex foreign policy issues relating to countries she almost certainly could not locate on a map, even though she specialized in international relations in college, which was only a few semesters ago. 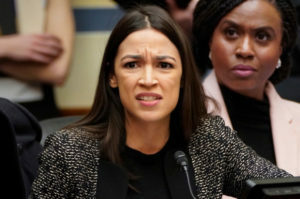 Get used to it, because while Republicans are celebrating her elevation as the new face of the Democrats, she is, in all respects, the quintessential millennial, often wrong but never in doubt, and there will be more after her. This is problematic because no group of people, and it’s a large group, are more convinced of their assumptions than millennials, precisely because so many don’t know anything, and therefore facts don’t ever inconvenience their self-perceived wisdom. So naturally they’re socialists, and leftists in general, because that’s easy; it doesn’t require knowledge, just an understanding that all of the world’s problems are caused by some combination of the Big Three Isms: racism, sexism, and capitalism. Congratulations, now you’re an intellectual. And the fact that so many millennials leave college — for which they paid a lot and at which they did not learn a lot — only to find that the job market does not reward their self-esteem, simply reaffirms their conviction that the world is unfair and/or rigged, as is an economic system that rewards value, and both must therefore be modified by an increasingly authoritarian government. Great. Conservatism, on the other hand, is not so easily accessible, because it requires a certain core competency. Capitalism needs to be understood. History needs to be learned. Reality needs to be experienced, and more than that, acknowledged, even when it presents uncomfortable truths. Everything has a cost, even well-intentioned ideas. The road to Hell is paved with good intentions. Unfortunately, the rest of us are at the mercy of increasingly uninformed voters, who elect equally uninformed politicians, who wish to speed us all down that road, because at least then we’ll all arrive at the same place together. And who better to put at the wheel than a millennial socialist who, like so many other millennials unable to find work in their given field, will now be employed by the government.